Highland, you certainly know how to do a send off! Sunday was filled with bittersweet moments, sacred rituals, and such meaningful exchanges with the family of faith I dearly love. 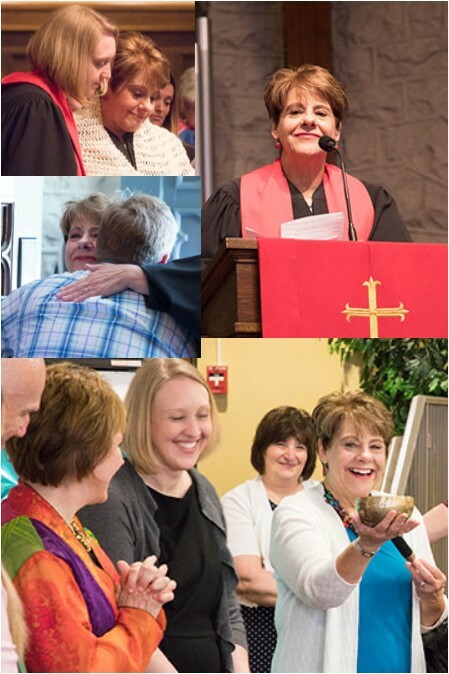 Your support and care were so evident in the thoughtful litanies and blessings in the worship service, the very personal and meaningful gifts you gave me at the reception, and your words of love and encouragement. It all reflected the deep and abiding love we have shared over the years. I know such a meaningful day doesn’t just happen and there were many who had a hand in making it all come together. Special thanks to our incredibly gifted ministerial and support staff. I saw your love and care throughout all the events of the day. Our hospitality group knows how to throw a party! I so appreciate all those who brought food, set up, cleaned up, and made the reception such a delightful gathering. You are pros! Special thanks as well to the leaders of the Deacons and the Personnel Ministry Group for your many thoughtful expressions of love and support and the beautiful window etching. Thanks to Bill Campbell and Mac Brown for the visuals of our history together that I will forever cherish. Thanks to Allison Keenan for her incredible talent and vision that went into the making of the picture with our mission, vision, and core values statements that are Highland’s DNA—past and present! And thanks to you, the church for the beautiful notes, cards, gifts, and words of affirmation and care. I will cherish all of these good gifts in my heart forever. While I need to be away for a time, I continue to pray for the church. There are many changes ahead, but I know you are a strong body of believers who seek to embody the mission God has set before you. So be kind to one another in the moments of disequilibrium and stress, never give up believing that God is in charge of the beautiful future that is being prepared for Highland, and continue to be light and love in our community and world.